The Crawley Community Operations Team are part of the WSCC Communities and Public Protection Directorate. This directorate comprises of Fire and Rescue, Trading Standards, Prevention & Intervention and WSCC Community Safety and Wellbeing. The team is comprised of 3 people – Terina Bryant, Kath Brooks and Paul Niner. 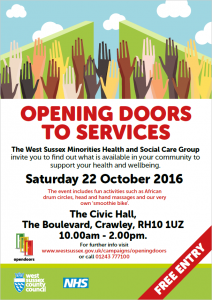 who are based in Crawley and support statutory, voluntary and community activity that improves the health and wellbeing of the residents of Crawley. Our team works supporting WSCC Elected Members in their role as Community Champions, and we provide WSCC Commissioners with “on the ground” local contact to communities and voluntary organisations. WSCC is keen to work with residents on creating local solutions to issues that impact and affect them – and our team works with our partners in the County Council and Crawley Borough Council to strengthen community resilience. Additionally, we promote and administer the WSCC Grants programme for Small Grants (up to £1,000) – and work with Members and colleagues on 2 other WSCC funding streams – Community Initiative Fund and the Members Big Society Grant fund. Connect to Support – This is a new website for care and support, information, advice, products and services for adults in West Sussex. You can either go online or if you need help using the website, you can call the Adult’s Carepoint on 01243 642121. The information has details of local products that can help you at home, local activities and groups, and you can buy care products and services in the online market. Additionally, you can find information about getting funded social care. Hate Incident Support Line – A significant priority within WSCC’s work on developing stronger, more resilient communities is to tackle hate incidents and hate crimes. As part of this work, we commission a Hate Incident Support Service from Victim Support. A hate incident is actions or words that are targeted at a person because the perpetrator is hostile or prejudiced towards the victims actual, or perceived disability, race or ethnicity, religion or belief, sexual orientation, or transgender identity. Anyone can be a victim or a witness of a hate crime or incident. Memory Walk – this is the first year that this will be in Crawley! 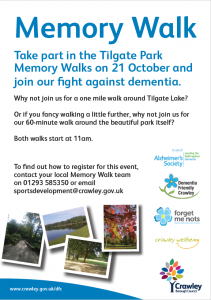 It takes place on Friday the 21st October at 11 am at Tilgate Park. There will be 2 walks- a short walk around Tilgate Lake, and a longer 60 minute walk around the park itself. The event is to raise funds for Alzheimer’s Society. After the walk, why not stop and have refreshments – home made cakes made by the Forget Me Not Club in Crawley. 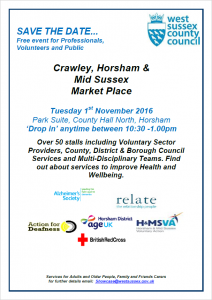 Showcase Event – not in Crawley, but in Horsham. This year the event is open to the public, as well as professional teams working in health and social care. There will be over 50 standholders from the voluntary sector, District and Borough Councils as well as the multi-disciplinary teams. Come along – it is free and is a drop in from 10.30-1pm on the 1st November at County Hall North, Horsham. 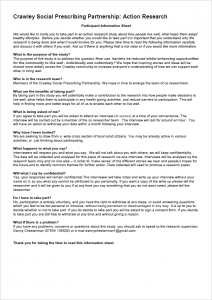 Action Research – we are looking for volunteers who are happy to spend approximately 45 minutes to an hour being interviewed on a one to one basis. The aim of the interview is to find how people live well, what helps them adopt healthy lifestyles. We hope that inspiring stories and ideas will be shared more widely across the Crawley community to increase everyone’s understanding of how we can support each other in living well. This entry was posted in PH(N)RA, West Sussex County Council by admin. Bookmark the permalink.